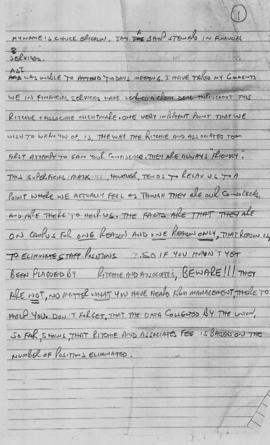 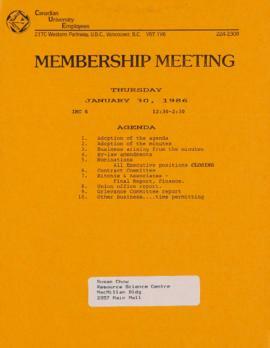 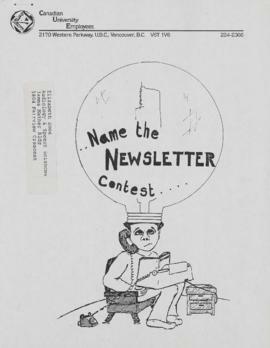 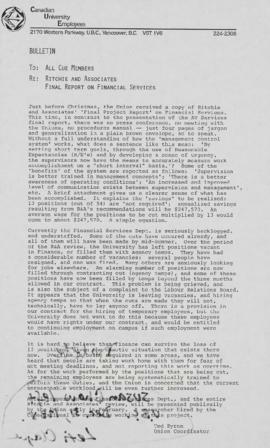 File contains newsletters of Canadian University Employees (formerly Local 1 of AUCE), a CUPE-CUE Report on the first year of affiliation, carbon copy of a list of CUE officers submitted to CUPE, a January 30, 1986 membership meeting bulletin, hand-written notes regarding the presence of U.S. efficiency analysis firm Ritchie and Associates, and a bulletin regarding Ritchie and Associates' Final Report on Financial Services. 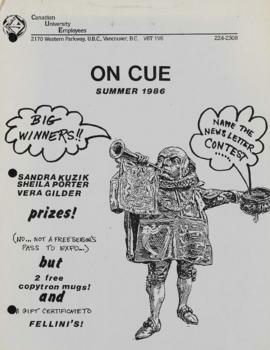 On Cue, Summer 1986 newsletter includes a CUE representatives directory, Grievance Committee report, Health and Safety Report, two reports on the CUPE BC 23rd Annual Convention, reprinted article from the Canadian Labour Congress on free trade, information on contractual obligations for medical leave, report and open letter on campus daycare, an update on activity and presence of Ritchie and Associates, a report on St. Paul Hospital's negotiations, and a letter to the editor regarding leadership of the Social Credit party. 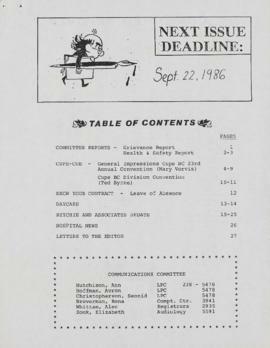 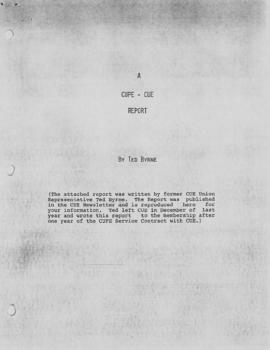 [May 1986] newsletter includes a Contract Committee report, Grievance Committee report, CUE for Safety report, a report on the risks of video display terminals, a Union Office report, a report on the benefits of CUPE affiliation, letters to 'Your Cue' (Editor's Corner) from Local 1 members, correspondence opposing Ritchie and Associates, an article in solidarity of the Hospital Employees Union, information on South African apartheid, statement requesting support of child care, and a "Name the Newsletter Contest" ballot. 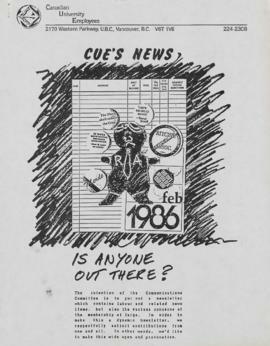 CUE's News, February 1986 newsletter includes a statement on office restructuring, update on wage increment implementation at UBC, Grievance Committee report, October 1985 CUPE National Convention report, Contract Committee report, letter of thanks from the Daycare Council, Job Evaluation Committee report, reprint of Current Disputes, and correspondence regarding the Pacific Western Airline dispute. 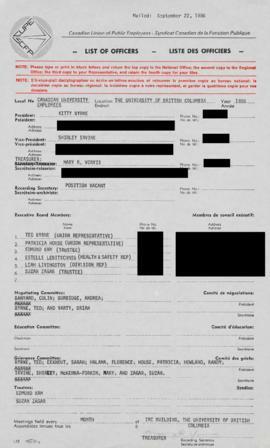 Items containing personal information and outside publications have not been digitized.